George Gordon Byron (1788 - 1824) was born in England but traveled extensively and spent almost as much time in Greece and Italy as he did in his home country. The bad boy of British poetry (one esteemed lady called him ?...mad, bad, and dangerous to know!”), Lord Byron's colorful life fit right in with the family from whence he came, but rather than detract from his poetic talent, his escapades merely enhanced his persona. His first collection of poems received poor reviews but subsequent work was highly praised and Byron (he was never called George) enjoyed enormous success throughout Europe and abroad, on par with today?s rock stars. 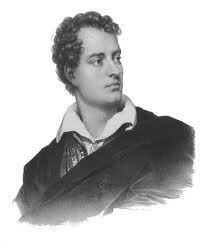 In addition to being a poet, Byron was a member of Parliament devoted to social reform, and he served as a soldier. Despite a club foot and violent mood swings which suggest he may have been manic-depressive, Byron was much loved for his loyalty and much admired for his handsome physique. An athlete and vegetarian, he was an animal lover and had a pet bear while in college. He also had, at one time or another, a monkey, an alligator, a fox, a badger, and a falcon. Utterly lovely. Does one have to have such extraordinary inklings in order to see the universe and gather such words. I wonder. How ungifted am I. This must be a very "poetic" time of day--this "hour" when day melts into night. We have had a number of magnificent poems that have addressed this magical time. These poems poem touch upon universal feelings, no doubt. Nice piece!